Geekvape Peerless RDTA Review: A Great Performer in 2018! The Geekvape Peerless line of atomizers is one of the latest coming from Geekvape who’s well known for delivering excellent performing atomizers at affordable prices. The original GeekVape Peerless RDA was a favorite by many vapers and even made it to our Top 10 RDA Article. Geekvape is now back with a new atomizer to add to this line and have released the Peerless RDTA which adopts some of the key features of the RDA, but adds a tank section underneath. Before getting any further into this review, we’d like to thank Efun Top and 3avape for sending this atomizer our way for the purposes of this review. We will go over our first impressions, building, and wicking, performance, pros and cons and then conclude with whether or not we recommend the GeekVape Peerless RDTA! The Peerless RDTA that I did receive was the sample version; therefore the final retail packaging could be different. However, if this was the retail packaging I wouldn’t really have an issue with it since I do like its simplicity and it does keep everything secure while in transit. The front of the packaging clearly states the name of the atomizer, and the back gives some minor details about what’s inside. 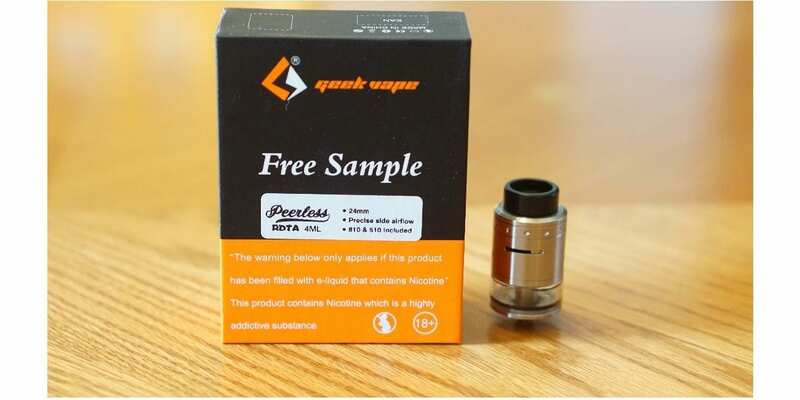 Included with the Geekvape Peerless RDTA you do receive the atomizer itself, a wide bore delrin 810 drip tip, a delrin 510 drip tip adapter, a spare glass tank section, a pair of exotic coils, a ceramic block for single coils, a 510 delrin drip tip, a bag of spare parts and a user manual. It’s definitely a pro that Geekvape includes all of these extras as this always adds value to your purchase. In addition, they are known for adding many extras in the packaging, so I’m glad they’re sticking to it. The base diameter of this atomizer is 24mm, so it’ll look great on most devices you attach it to. Upon first glance, you do see the “Peerless” logo right on the top cap, and it’s not too flashy or anything, which is great. The 810 wide bore delrin drip tip is already installed, and it’s a pro for sure that you can use both 510 and 810 drip tips with this atomizer, as we know many of our subscribers really enjoy using their custom drip tips! The version I did receive is the 4ml variant, but they do say there is a 2ml TPD version available. I’m not entirely sure whether they’re adding a silicone piece to drop the e-liquid capacity or releasing a TPD version separately. Also, I did receive the stainless steel color, but there are tons of other color options available such as Black, Gold, Red, and Blue. What makes this RDTA different from some of the others on the market is its fill system. It features a hinge lock filling system which is located right next to the edge of one side of the build deck. I do like this fill system, and this is something I’ll get more into later on in this review. Just like the Peerless RDA, this atomizer does feature fully adjustable side airflow. Something worth mentioning is that the top cap is one solid piece, so the airflow control is built into it; therefore you cannot take it apart and clean it. Usually, we see the top cap and the airflow control section being separate. This can be seen as a con since you cannot completely take it apart when it comes to cleaning, but when you are cleaning it simply turn the airflow while washing it to ensure all parts of the inside of the top cap is being cleaned. The Peerless RDTA did come clean with no machine oil whatsoever, which is certainly a pro in my book! One wash with warm water and this atomizer was ready to be built. Not to mention, the fit and finish of this RDTA are top notch! All in all, my first impressions of the Geekvape Peerless RDTA was great! I didn’t really have any cons to be mentioned right away, which is always a good thing! The Peerless RDTA by GeekVape does feature an upgraded Peerless build deck. If you’re used to the build deck from the original Peerless RDA, then this one will be a breeze for you. To describe the deck itself, it features 2 posts with multiple post holes meant for different coil builds. For example, there are slots which are much more suited to thicker coil builds such as Fused Claptons and Aliens, and then there are other post holes which are more suitable for simple round wire builds. 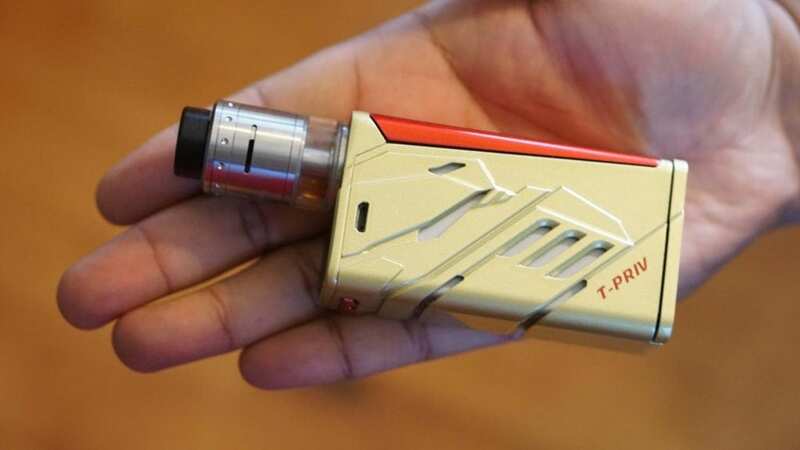 In addition, since there are multiple post holes, you have tons of different options in regards to what you can actually install in this atomizer. For example, you can utilize the two post holes towards the ends of the build deck to install your longer Clapton builds or the two inner post holes for your simple round wire builds. 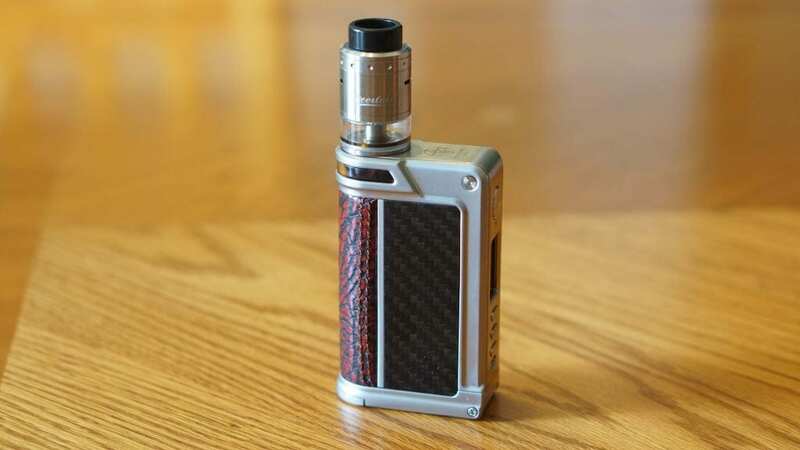 This is definitely a pro as it’ll suit many vapers preferences when it comes to what you can install. With this build deck, I was easily able to install a spaced Dual Stainless Steel Fused Clapton with zero issues. Something worth mentioning is that the screws to screw in from the top, which is great for your exotic coil builds as a design as such won’t really twist or bend your leads. Wicking is also very easy and straightforward. Simply cut your cotton to the point where you know the cotton will pole into the tank section, fluff it out and then gently tuck your cotton into the wicking ports. You can unscrew the base section to gain access to underneath your build deck if you want to pull the cotton through with tweezers which always helps when it comes to wicking these style of atomizers. I found that the best way to wick this RDTA is to have the cotton barely poking out into the tank section, and this also leaves you more room for e-juice in the tank section. Overall, build and wicking the Peerless RDTA is easy! I do like this style of build deck as it can accommodate pretty much any build you throw at it. Not to mention, wicking can be done quite easily as well. Now the biggest question of this vape review is how does this atomizer perform? Well, I can surely say the performance is great! Firstly, my preferred coil build was a spaced Dual Stainless Steel Fused Clapton which had a resistance of 0.19 ohm. I did try other coil builds as well such as round wire builds and other Clapton coils such as contact Fused Claptons, and Triple Core Fused Claptons, which all performed well. I also tried a single coil build, but I personally liked how dual coils performed in this atomizer. With this specific coil build, I would vape it between 60w and 80w. In addition, in temperature control mode, I would vape it at these wattages, but have the temperature set between 440F and 480F. At these settings, I would get a warm vape, which is something I do prefer. The flavor is very good, and better than what I had expected. I do recommend positioning your coils just a bit higher so that the airflow can hit both the sides and underneath the coil. Speaking about airflow, it is incredibly smooth and very easy to adjust. I do think due to its design of being one solid piece, it makes the airflow adjustment smooth and easy. Even though the airflow is smooth, it is slightly on the noisy side, especially when you start to close off the airflow. Since I did like to close off the airflow about 1/4 of the way, I did notice it quite a bit. When the airflow is wide open, you don’t really get much noise. The vapor production is also very good with the Peerless RDTA. I do want to mention that there is not a ton of airflow available, but I think it would satisfy the vast majority of vapers. However, if you do like a wide-open draw with very little restriction, then this RDTA might not be for you. As mentioned earlier, this atomizer does have a 4ml e-liquid capacity and features a hinge lock filling system. The hinge lock is located behind one of your coils, so you do have to be careful when opening and filling. In addition, there is a piece of peek that is there and helps keep the seal secure so you won’t experience any leaking. This does tend to pop out here and there and is not very easy to put back into place since it’s so small. In addition, the opening itself is not large either, but you’ll get away with dropper bottles and unicorn bottles. Lastly, the hinge itself is a bit on the looser side, which can be seen as a con. All in all, the performance of the Peerless RDTA is great! The overall performance is pretty similar to the RDA variant, so if you’re a fan of how that performs, then you’ll love this RDTA! In conclusion, the Geekvape Peerless RDTA is a solid performing atomizer that offers a unique fill system and a build deck that can accommodate various coil builds. I’m happy that Geekvape decided to keep this style of build deck as it’s very easy to work with, and the fact that you can install builds from simple round wire to exotic builds such as an Alien or Fused Clapton is a huge pro in my opinion. Not to mention, it does come with a single coil block, which is great for you vapers who prefer single coil builds. Even though its performance and features are great, there were still some cons to be mentioned with this one. Firstly, the slightly noisy airflow may not bother some vapers, but it’s still something worth mentioning as it can become annoying. In addition, I do wish the hinge for the fill system was more secure and hopefully, this is fixed in the retail version. Lastly, the top cap being one piece is subjective as the only issue with this is that you cannot take it apart when it comes to cleaning. With that being said, the Geekvape Peerless RDTA is still a great performing atomizer and it’s available at an incredibly affordable price. If you’re looking for a new RDTA and a fan of the original Peerless RDA, then I can definitely recommend checking out the Peerless RDTA.